Published in the Proceedings of the National Academy of Sciences, this study is the first to systematically measure the number of neurons in the brains of more than a dozen bird species, from tiny zebra finches to the six-foot-tall emu. By doing so, neuroscientist Suzana Herculano-Houzel and her team at Vanderbilt University discovered that avian brains contain more neurons per square inch than mammalian brains. This means that birds pack more brain power per pound than mammals, offering an explanation for their remarkable cognitive talents. What’s more, the study shows that evolution has found more than one way to build a complex brain. Scientists have long wondered how birds—with their teeny-tiny brains—are capable of exhibiting many complex behaviors, some of which were thought to the be exclusive domain of larger primates. Birds can manufacture tools, cache food, plan for the future, pass the mirror test, use insight to solve problems, and understand cause-and-effect. They’ve also been observed to hide food in front of other birds, and then relocate that food when the other birds aren’t looking. This suggests that birds have a “theory of mind,” which means they’re capable of inferring what other birds are thinking. Very few animals can do that. Prior to this, scientists just figured that avian brains were simply wired in a completely different way compared to primate brains. But this theory hasn’t been borne out empirically; studies have shown that avian brains are structured quite similarly to mammalian brains. 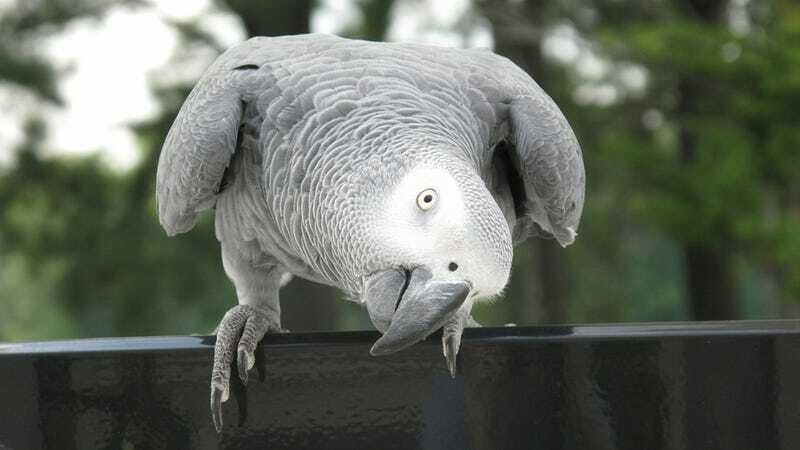 The parrot, for example, has as many neurons in its walnut-sized brain as the macaque monkey, which has a larger brain about the size of a lemon. When the functional connectivity of avian brains are mapped, it looks similar to what’s found in mammals, such as mice, cats, monkeys, and even humans. But by packing these neurons in such a dense fashion, birds have been endowed with higher cognitive power per pound than mammals. This means that evolution has found more than one way to build a powerful brain. Previously, neuroscientists thought that, as brains grew larger, neurons had to grow bigger as well in order to be able to connect over large distances. The new study shows that there are other ways to add neurons, namely by keeping them small and locally connected, while allowing a small percentage to grow large enough to make longer connections. This keeps the average size of neurons down, which allows for a smaller brain. The researchers aren’t sure which of the two brain types evolved more recently. It’s possible that the super-compact avian brains came first, and that mammals evolved a “different” kind of brain. Or perhaps birds, who are descended from dinosaurs, evolved their highly efficient brains as a requisite for flight, since birds need to be light and agile. More conceptually, a growing number of scientists, bioethicists, and legal scholars have been making the case that highly sapient and cognitively complex animals should be awarded personhood status, which would afford them special protections. So, in addition to all great apes (a group that includes humans), whales, dolphins, and elephants, we should also include certain birds, such as corvids and parrots.